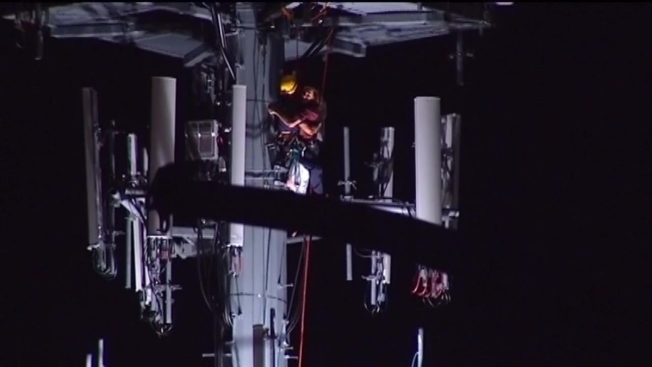 An Illinois man, 18, was rescued late Friday night after he climbed a cell tower behind the Northfield Fire Department, and the dramatic rescue was captured on camera. According to Assistant Fire Chief Tom Burke, area residents went to the fire station and told officials they heard a person in the back of the department’s property on top of a tower pole. Officials then went to the scene and found someone at the top of a cell tower roughly 110 feet tall. Burke said fire officials called for more personnel to assist in the rescue and members of the department climbed the tower to help the man down. “We got up there, we got him and we got him down successfully,” Burke said. Officials managed to lower the man safely into a tower ladder basket, according to authorities. He was taken to Highland Park Hospital for treatment following the incident, Burke said. His condition was not immediately known. The Northfield Police Department is investigating. It is not clear if charges will be filed.